The Orange County Department of Education is joining forces with its counterparts in Los Angeles, San Diego, Riverside, San Bernardino and Imperial counties to host a special presentation this month featuring Sal Khan, founder and CEO of Khan Academy. 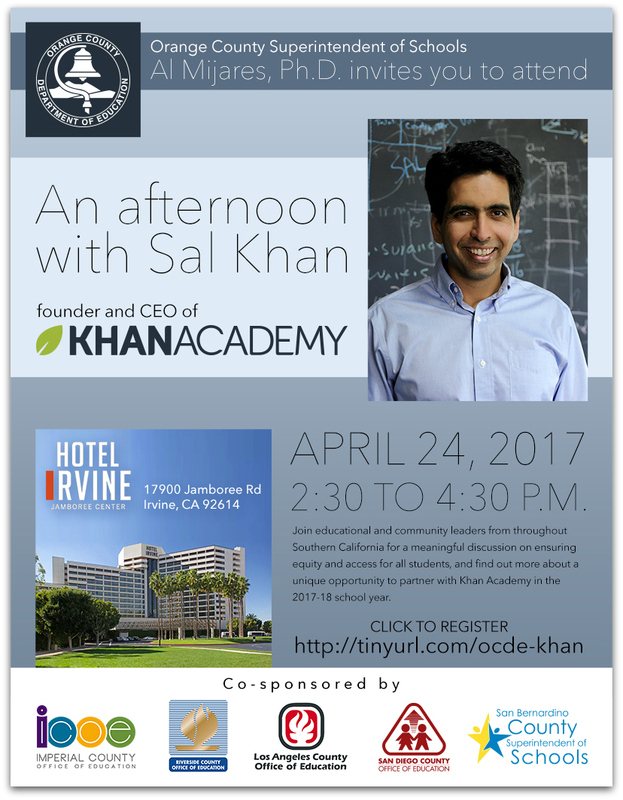 Teachers, school administrators, business leaders and elected officials from throughout Southern California are encouraged to attend “An Afternoon with Sal Khan” from 2:30 to 4:30 p.m. on Monday, April 24 at Hotel Irvine, 17900 Jamboree Road in Irvine. The presentation, open to guests who register here, will share strategies for ensuring equity and access for all students. In addition, educators will learn about opportunities to partner with Khan Academy in the 2017-18 school year. Founded more than a decade ago, Khan Academy provides practice exercises, instructional videos and a personalized learning dashboard to help individuals study at their own pace in and out of the classroom. Subjects include math, science, computer programming, history, art history, economics and more. In 2015, Khan Academy also partnered with the College Board to provide free, personalized SAT preparation tools and practice tests for students. There is no cost to attend the event. Visit tinyurl.com/ocde-khan to register by April 20, or contact Jan Mackey at 714-966-4007 for more information.